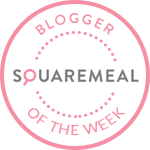 Emily's Recipes and Reviews | UK Food Blog | Leicestershire : homemade farfalle with prawns, courgette and white wine sauce. What a wonderful idea! I always look for such creative and delicious recipes. I often do experiments with wine and fish, but I have never tried something like this. I will definitely try this recipe at my home. I hope my husband will like this dish.